How effective are we in sharing our passion for great extra virgin olive oil? Just how wise is the common wisdom about olive oil marketing and promotion? Are there compelling elements of the olive oil experience we don't talk about enough? Do we adequately communicate the transformative culinary power of modern extra virgin olive oil? In this seminar we will examine practices in olive oil communication: the words, images and ideas most companies use, and the assumptions that lie beneath them. We focus on English-speaking markets and the challenges and opportunities that lie with these novice consumers, but this seminar is also relevant for traditional consuming nations. 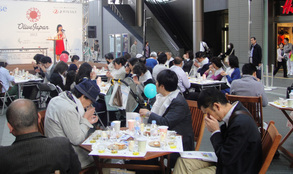 We will also do a tasting exercise with olive oil and food to explore the “Taste” part of this issue. Presenters: Alexandra Kicenik Devarenne, co-founder Extra Virgin Alliance and international olive oil writer, teacher, consultant and judge based in California; Johnny Madge, olive oil tours and olive oil judge in international competitions based in Italy; and Malcolm Gilmour, importer, olive oil writer and translator based in Oxford, United Kingdom. Check Out the Exclusive Interview from WOOE with Alexandra, Johnny, and Malcolm! EVA Co-founder and CEO, Alexandra Devarenne, is speaking at the Yale School of Public Health Department of Environmental Health Sciences Olive Oil and Health: New Frontiers and Partnerships for Research and Education Symposium at 10:00 am 3 October, 2018. Her topic is US Olive Oil Market: What's Broken and How We Can Fix It. Follow the links to the Symposium Home Page, Agenda, and Speaker Profiles for more information. Check out the live stream links below. 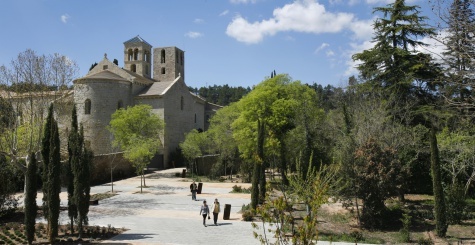 In the shadow of a Medieval monastery outside of Barcelona (Món Sant Benet, Spain), a world class team of olive oil experts will convene 19–23 March 2018 to teach an olive oil evaluation course Tools for the Trade: Tasting, Testing and Understanding Olive Oil. Organized by IRTA, the Catalan institute for Research and Technology in Food and Agriculture, this five-day course-taught in English-provides the solid foundation needed by traders and producers to make good olive oil decisions. 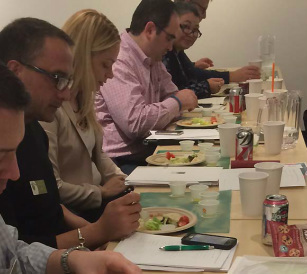 At its heart this is an olive oil sensory analysis course, but it continually enhances the tasting lessons with lectures on the "what, why and how" of olive oil production, health benefits, regulation, culinary uses and more. 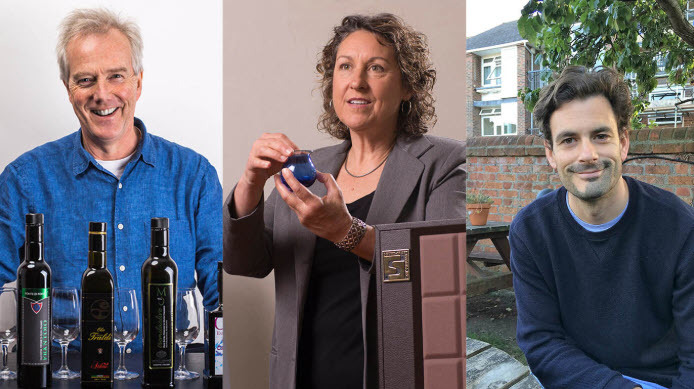 The emphasis in this course is on practical information that is supported by research and experience: it aims to equip you with the toolbox you need to be a better buyer, marketer, producer, retailer, chef or aficionado of olive oil. Participants will receive a course certificate and a set of specially-produced standard defect samples to take home with them for continuing reinforcement of the lessons of the course. An array of international experts will share their olive oil knowledge and dozens of specially selected olive oils. 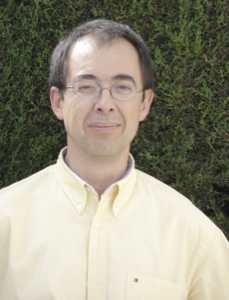 A solid foundation of olive oil sensory analysis is central to the course, with detailed instruction in tasting technique, intensity training, recognizing common defects and describing positive attributes led by Agustí Romero and Luis Guerrero of IRTA, and Alexandra Devarenne of Extra Virgin Alliance. In addition there will be tasting flights highlighting premium extra virgin olive oils from numerous regions of the world, led by panel leaders like Juan Ramón Izquierdo of the Spanish Ministry of Agriculture arbitration laboratory, Ana Brito Carrilho of the official Taste Panel in Lisbon, Portugal and Manolis Salivaras of Greece. The presenters include chemistry researcher Stefania Vichi of University of Barcelona, sensory scientist Erminio Monteleone of University of Florence, olive oil function researcher Rosa Lamuela of University of Barcelona, olive processing technology specialist Gabriel Beltrán of IFAPA in Andalusia and olive oil standards expert Paul Miller of Australia. Recognizing that producing good olive oil is just the first step, the course will also explore end user needs, communication and experience. 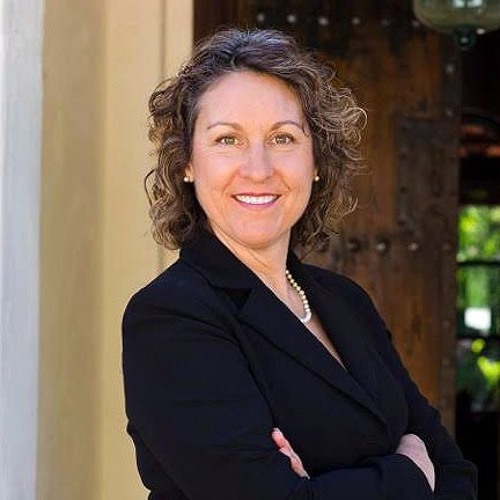 Culinary considerations and the challenges of marketing will be addressed by Maria Reyes of KeHE Distributors, David Neuman of Gaea North America, Rosa Vañó of Castillo de Canena and chef-researcher Jaume Biarnés of ALICIA Foundation. To learn more, visit the course website, including an overview of the program and a full list of the instructors. 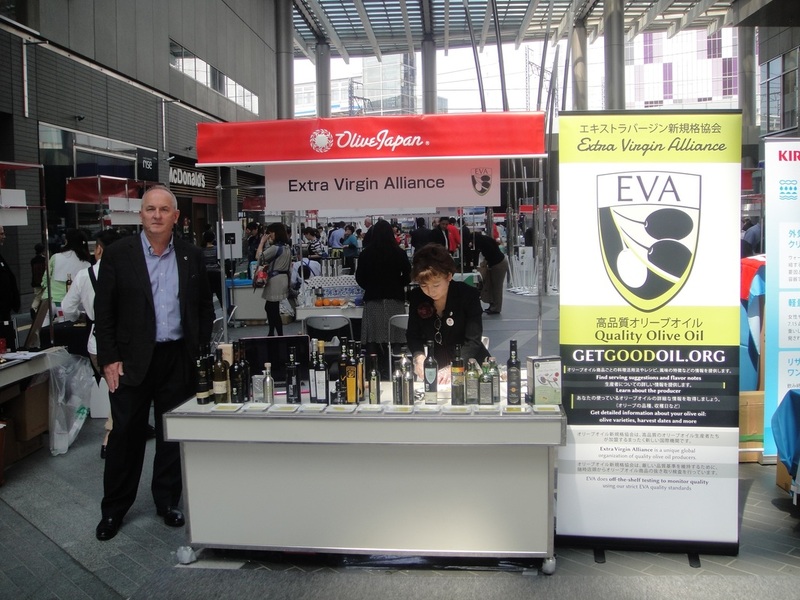 EVA will be at Futoka Tamagawa Rise at the Olive Japan Marché in Tokyo. 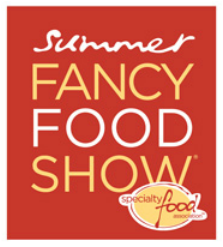 Come visit us at Booth #5450 at the Summer Fancy Food Show in New York! To honor the EVA mission to EDUCATE, we are presenting Tips For Buyers and other relevant olive oil education while we CONNECT you with EVA producers from around the world so you can sample their extra virgin olive oil as we CELEBRATE this wonderful food with passionate people sharing their experiences and ideas! Featured in New York are Domenica Fiore, Lucero, Castillo de Canena, Marques de Valdueza, Moulin Castelas, Willow Creek, McEvoy Ranch, Santiago, Longridge Olives, First Fresh and Albea Blanca. This class for people who already have a good basic ability level in olive oil tasting but wish to expand their knowledge and skill. Topics will include sensorial and chemical characteristics related to growing and environmental factors, post-harvest handling, processing effects and storage. In addition, up to 20 oil samples will be tasted in order to explain each sensory attribute and the relevance of targeted tasting procedures. The class will discuss practical olive oil chemistry, processing challenges, maximizing quality, adjusting the process according to sensory outcomes, future developments in processing especially malaxing and boosting sensorial analysis by volatile analysis. A light breakfast, lunch and a tasting of McEvoy Ranch wine are included. Prerequisite: Completion of a basic olive oil tasting course, membership in a taste panel or other olive oil tasting experience. Join experts from science and industry in this fun practical workshop at Rosen Shingle Creek Resort! The workshop is an excellent opportunity to see (and taste!) how the various aspects of olive oil quality fit together: official sensory analysis, chemical analysis, market and regulatory realities and the culinary experience. Taste six great olive oils with your lunch, and explore the diversity and dynamics of this ancient and delightful food. 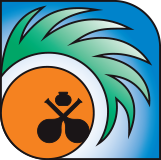 Although this event is being held as part of the annual meeting of AOCS. 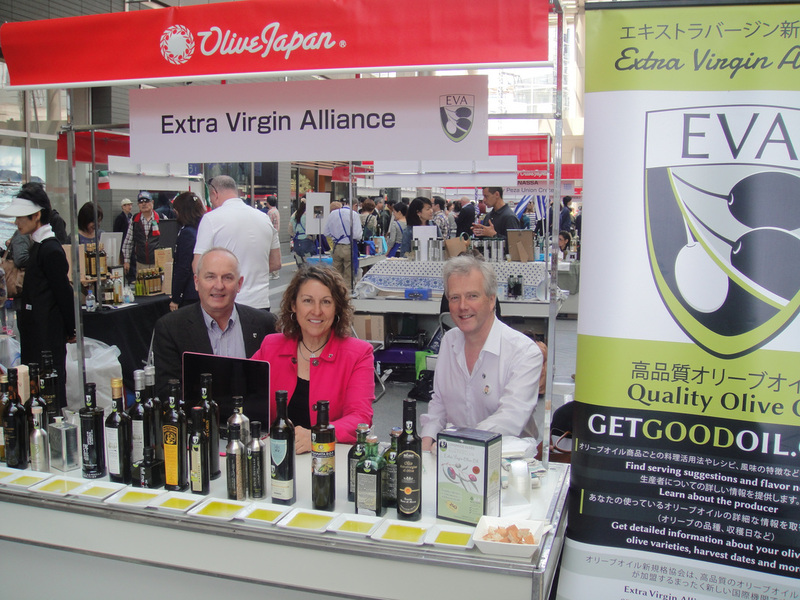 Extra Virgin Alliance is proud to be supporting Olive Japan 2015! 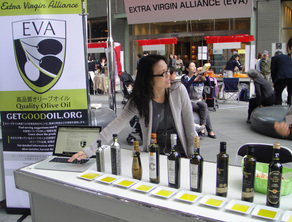 At the EVA booth you can sample extra virgin olive oil from our members, and also meet and chat with EVA members and associates. Saturday and Sunday from 10 am to 7 pm. Experts from the EVA network will head up a day-long seminar Sensory Evaluation of Olive Oil: Tradition, Innovation, Exploration and Integration. Details will be announced soon for this valuable and exciting event! Simultaneous translation is provided. EVA will be sampling member oils in Booth 7502 at the Natural Products Expo! EVA will be at the Winter Fancy Food Show in Booth #329 in the North Hall. Come by and say hello! 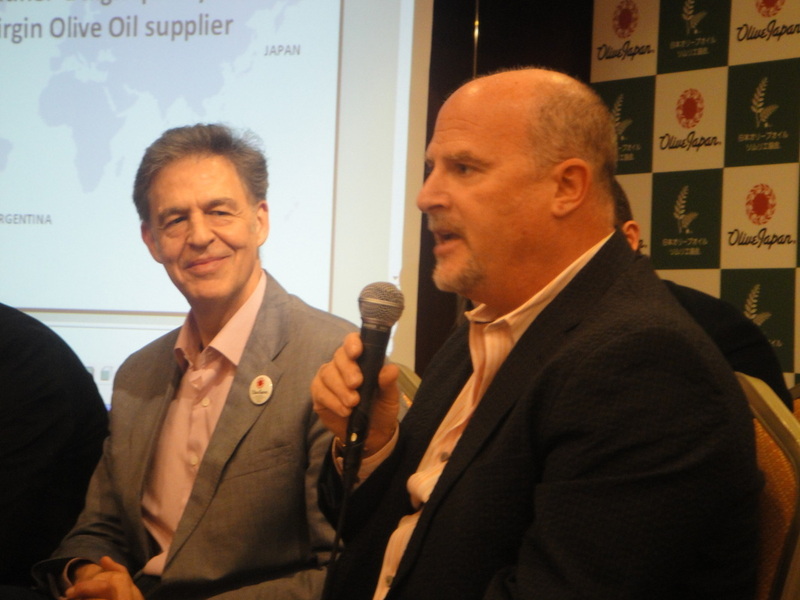 EVA will be participating in the Olive Japan Symposium, doing presentations, a tasting class and panel discussion. Simultaneous translation is provided.